There are two reasons not to rent a large car in Italy. First, gas is expensive enough (around $6 to $8 a gallon) without having to feed a big engine haul around an oversized chassis. More importantly, the winding Italian roads and narrow ancient streets of its medieval towns were built with pedestrians and horse carts in kind, not wide-bodied luxury sedans.The wind in your hair, the autostrada stretching before you, the freedom to explore at will, the fact that speed limits are fairly optional... A car is the only way to see all of Italy's nooks and crannies. This section covers in depth tips on renting a car in Italy (and looking into short-term leases to save on rentals of longer than two weeks), everything you need to know about the rules of the road in Italy, driving tips, and Italian road signs, a primer on the metric system as it pertains to driving (converting kilometers to miles and liters to gallons), and tips for saving money on car rentals. You can click on those links above for detailed information on each subject, or just scan the quick take of top tips listed below, a collection of all the vital info you really need to know for renting a car and driving in Italy. Don't rent more than you need. We're talking both the time you'll need the car, and the kind of car you'll need. First, rent for as short a period as possible. 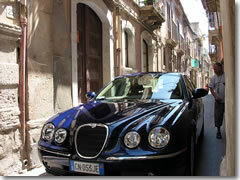 Don't rent a car for the full two weeks if you're spending your first four days in Rome. You don't need a car in Rome (driving is insane, street parking impossible to find, and garages expensive). In fact, you don't need (or want) a car in any major city: Naples, Florence, Milan, Palermo, etc.—and you literally can't drive one in Venice. Public transport in cities is fast, efficient, and cheap (see Tip 6 below for more). Arrange to connect major cities by train, and just rent the car for the shorter period when it is truly useful (hilltowns of Tuscany & Umbria, say, or exploring Sicily or Apulia).